What happens when you excite novel assemblies of nanomaterials using structured light? Joint research between Tampere University of Technology (TUT) (Finland) and University of Tübingen (Germany) has shown that carefully structured light and matching arrangements of metal nanostructures (so-called "plasmonic oligomers") can be combined to alter the properties of the generated light at the nanometer scale. In particular, the teams have shown that the efficiency of nonlinear optical fields (e.g., second-harmonics) generated from the oligomers is strongly influenced by how the constituents of the oligomer are arranged in space and how these constituents are illuminated by structured light. Nonlinear optical processes provide the basis for important functionalities in photonics, such as frequency conversion of light, generation of ultrashort light pulses, as well as optical processing and manipulation. Further advancement of this field is expected to be fueled by the synthesis of novel nanomaterials with tailorable optical properties and by new approaches for coupling light efficiently into such nanomaterials. For the latter purpose, light beams with unconventional polarizations, so-called structured light, are expected to be crucial. 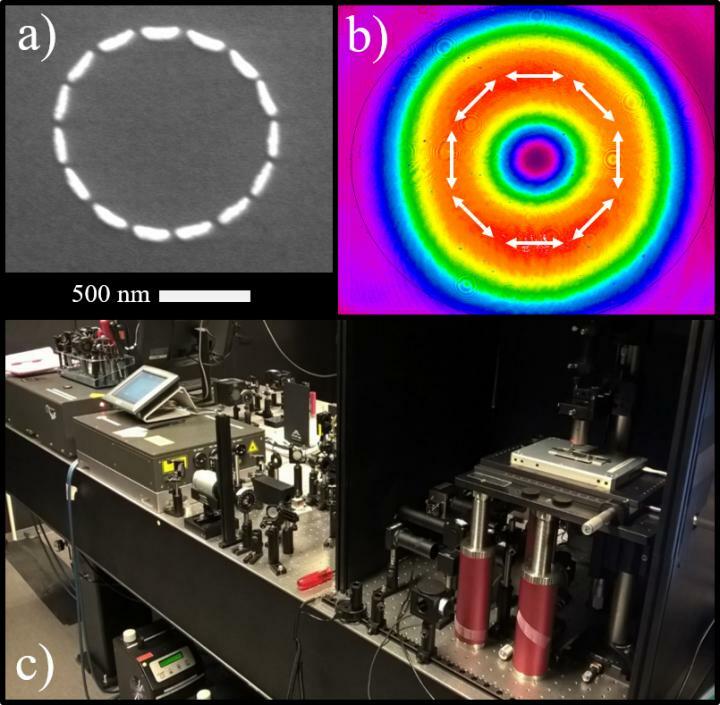 In order to demonstrate such capabilities, the authors designed and fabricated assemblies of gold nanorods with well-defined dimensions and orientations such that their overall size matches the size of a focused laser beam, i.e., about 1 micron. To investigate the nonlinear response of such plasmonic oligomers, the authors used a novel optical microscopy technique, which is equipped with polarization-structured beams. More specifically, the authors used radially and azimuthally polarized cylindrical vector beams that exhibit non-uniform states-of-polarization across the cross-section of the beam. "Previous works on nonlinear optical effects in plasmonic oligomers have been based on using plane waves or focused beams with homogenous, i.e., uniform, states of polarizations. Here, we used a nonlinear optical microscope equipped with doughnut-shaped polarization-structured beams to study such oligomers. We found that the overall efficiency of nonlinear optical effects from these structures is strongly affected by the spatial structure of the beam and collective interactions supported by the oligomer. We hope that our work will further spark interest in studying and manipulating nonlinear optical effects in novel nanoscale systems using unconventional excitation beams." says Dr. Godofredo Bautista, postdoctoral researcher at the Nonlinear Optics Group of the Laboratory of Photonics at TUT and co-corresponding author of the work. Professor Martti Kauranen, head of the Nonlinear Optics Group and Laboratory of Photonics, who supervised the research at TUT, states that "Beyond the nonlinear effects studied in the present work, our results show in general how important it is to tailor the incident optical beam in order to couple light efficiently into complex nanostructures". Professor Monika Fleischer, head of the Plasmonic Nanostructures Group at the University of Tübingen and co-corresponding author, who supervised the research at the University of Tübingen, adds: "Nanotechnology provides high-precision tools that allow us to tailor arrangements of metallic nanostructures, also called optical antennas, with pre-designed properties. This way specific interactions with non-conventional laser beams can be targeted, and overall signal intensities may be maximized." The researchers believe that their results will be useful in the design and implementation of new kinds of optical components and characterization techniques that utilize unconventional optical fields. This work was funded by the Academy of Finland (267847 and 287651), TUT Investment funding for Optics and Photonics and COST Action MP1302 Nanospectroscopy.